We’d love your help. 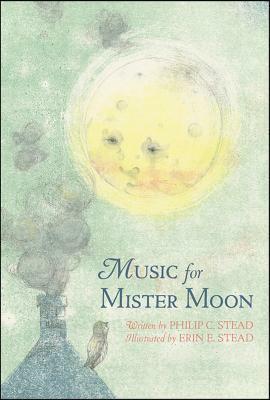 Let us know what’s wrong with this preview of Music for Mister Moon by Philip C. Stead. What if you threw your teacup out your window...and what if it accidentally knocked the moon out of the sky? A girl named Harriet longs to play her cello alone in her room. But when a noisy owl disrupts her solitude, Harriet throws her teacup out the window and accidentally knocks the moon out of the sky in frustration. Over the course of an evening, Harriet and the moon What if you threw your teacup out your window...and what if it accidentally knocked the moon out of the sky? To ask other readers questions about Music for Mister Moon, please sign up. Another beautiful book from the Steads about shyness and exploring what you love in the comfort of your own space, and not to the masses. When Harriet "Hank" Henry, throws a tea cup at an owl, and knocks the moon from the sky, she makes it up to him by doing things with Mister Moon that he's always wanted to do. Will she grant Mister Moon's final request, and play her cello for him, even though she is nervous about playing in front of anyone? Although I love Philip Stead and Erin Stead, I found this book lacking something. It didn't have the "magic" their books usually contain. I love the bear hatmaker and walrus fisherman! Unfortunately I am not a huge fan of this book and found it slightly boring, and the ending was not my cup of tea. Did not really know what to make of this story. Little girl uses her imagination to find privacy to play her cello. Beautiful illustrations. I don't know....Some budding musician may enjoy this tale, especially shy ones. Just seemed like there could be more to the story. Sorry. A gorgeous book about Harriet Henry and Mister Moon. While trying to play her cello, Harriet becomes annoyed by the hooting of an owl and throws her teacup, missing the owl but knocking to moon from the sky. Beautifully written and illustrated. Highly recommended. This book is incredibly beautiful. The story and the illustrations complement each other perfectly. Historically a fan of the Steads' work, I found myself not a fan of this latest collaboration. It's just odd. A picture book with a very dreamy feel. Love the owls!!!! Gentle, comforting, and whimsical story. This is the Stead-iest book yet. I read it with a furrowed brow throughout and I would not recommend it to *anyone*. And yet, it might be their masterpiece. Brandi Rae Fong I think you finally just gave me words to how I feel about most of Stead's books. It was a very pretty book, and there were lots of things about it that I liked, but it never really turned into a cohesive whole for me. Awesome but also pretty weird. Amazing pictures. Unfortunately the cello is shaped more like a small string bass but everything else was dreamy. Sweet and a bit quirky with beautiful illustrations as to be expected.